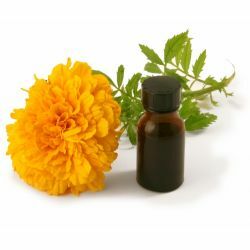 Our African marigold oil is made from the Tagetes plant (Tagetes erecta). It is from the species also known as American or Aztec marigold. Native to Mexico, North America and South America, it produces beautiful yellow or orange flowers. The Aztecs held Tagetes erecta and other varieties of the Tagetes plant in high esteem. Erecta was used for ceremonial and medicinal purposes and tagetes lucida was used to flavour the original, spicy hot chocolate drink chocolatl. Mexicans use erecta, and other types of marigolds, in their ‘Dia de los Muertos’ celebrations. It comes from the same genus as the dahlia and the daisy (Asteraceae). It should not be confused with Calendula officinalis, the common marigold. The oil is distilled from the flowers and used in cosmetics, medicines and fragrances. It has an herbaceous scent and helps to keep products fresh, acting as a natural preservative. According to modern research, the African marigold possesses antibacterial, antifungal and antioxidant properties. It is said to reduce skin blemishes and inflammations. We use African marigold oil in our Ambrosia shaving cream to help keep skin free of blemishes caused by shaving. We've used the oil in Helping Hands for its protective qualities.